Soothes, heals and revives tired feet after running leaving your feet feeling cool and refreshed. 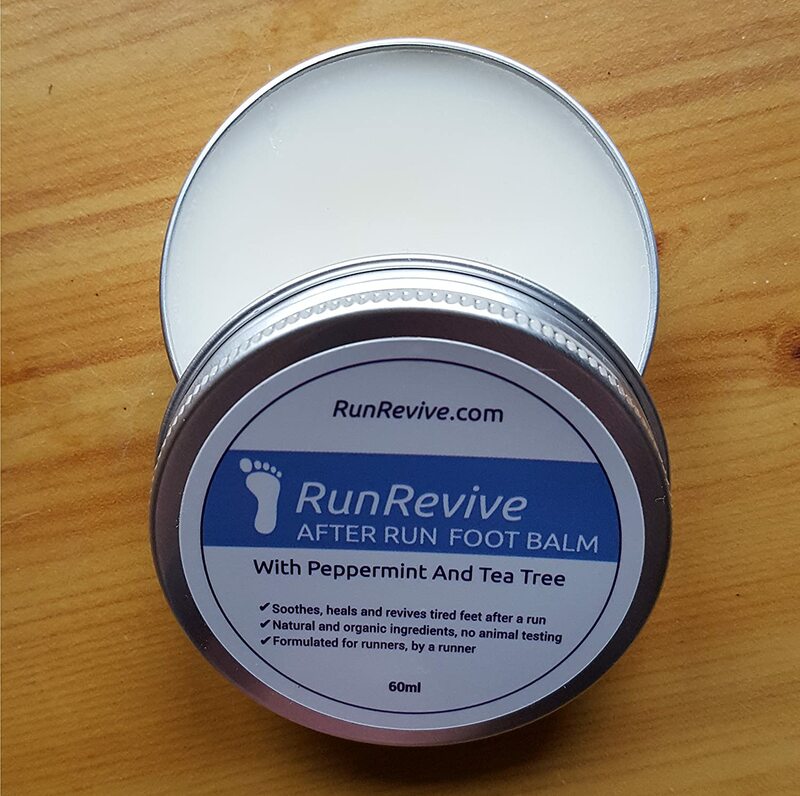 RunRevive contains organic peppermint oil which has a natural cooling effect. Helps prevent infections including athlete’s foot. RunRevive contains organic tea tree oil which is naturally antiseptic and antifungal. Keeps skin soft preventing cracked heels and painfully dry skin build up on pressure points. RunRevive contains a blend of natural butters and oils which moisturize the skin when massaged into the feet. Reduces recovery time and improves performance. By keeping your feet in peak condition, RunRevive helps you run stronger, longer and more often. All natural ingredients and no animal testing RunRevive is made from all natural ingredients and organic oils. There are no unnecessary parabens and it has not been tested on animals. I love the idea of ingredients that are all organic and natural based sources. According to the ingredients, there are no chemicals listed which is comforting. The tin size you receive of the product is fairly small approximately the same size as a mint container and looks very similar to Altoids can. It fits nicely in the palm of your hand and is easy to carry with you or throw in your tennis bag for when you switch shoes after a match. Upon opening the tin, you are immediately hit with a very pleasant light minty smell that makes you want to taste it (please don’t!). The texture of the balm is very similar to a white butter that is firm and yet responds to scooping and smoothing onto your feet. It’s more a stiff wax type feel than a soft cream or maybe a perfect blend of both. Once applied it feels very luxurious and smells nice. I think just the act of caring for your feet with a slight massage helps a lot and the added balm treatment adds a spa quality to care. I have been using the balm for about a week and feel that it does help my feet stay smoother and softer to the touch. I will save you from pictures of my feet lol but I do feel it helps especially since feet can easily be cracked and dry from so much exercise. By comparison, the only other foot treatment I have used besides standard lotion is BioFreeze cold therapy pain relief. BioFreeze has an active ingredient of 4% menthol and boy can you smell it and feel it. This stuff burns on the skin and the tingling can last for up to 20 minutes in my experience. It’s painful if you have some residue left on your hand and accidentally rub your eyes with it which sadly I have done. Some people like me enjoy the burn BioFreeze gives you on your feet but others feel it’s way too much sensation and can’t deal with it. There is also a level of alcohol in BioFreeze which may dry out the skin where RunRevive has essential oils and butters to prevent drying and cracking. The inactive ingredients list in BioFreeze is pretty long so I won’t list them all here but there is no doubt this is a chemical treatment whipped up in the lab somewhere. I really do enjoy BioFreeze but I know it’s not for everyone. RunRevive, on the other hand, is much milder and probably could work for most situations and most people. 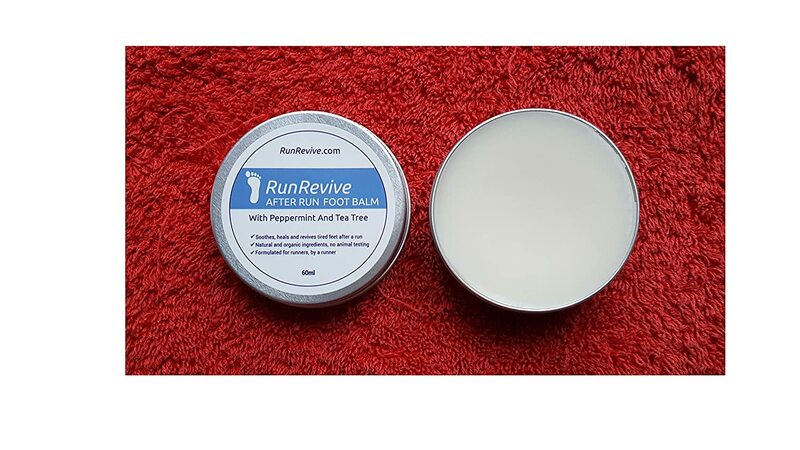 I really like RunRevive foot balm. It adds a minty preventative care to my feet and makes me feel like they are well taken care of. It’s hard to say if it immediately removes pain and that isn’t what they claim, but it definitely soothes and revives feet after matches. I think this product could be for anyone that needs a little foot care and isn’t really limited to sports issues. I can see how the using these daily could really put a spring in your split step. It also needs to be said that these products are not only limited to foot care as well. I am sure one might apply this on any muscle that aches or has pain and feel a sense of relief. Obviously, these should not be used on any area of the skin where there is a wound, cut, abrasion or external damage. If you have an level of injury please see a medical professional immediately. You can also check out BioFreeze which I enjoy and recommend as well if you don’t mind strong Menthol. It’s a great kind of distraction therapy for aches and minor pains. If you have any questions about this review or my use of this product, please send me an email I would love to hear from you! We are always looking for great products to review for the tennis community so let me know if you have something you want us to try out. Medical Disclaimer: All information, content, and material of this website is for informational purposes only and are not intended to serve as a substitute for the consultation, diagnosis, and/or medical treatment of a qualified physician or healthcare provider.